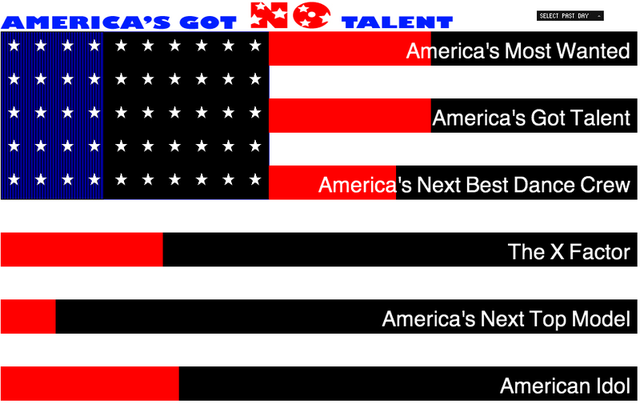 “America’s Got No Talent” is a web-based software project by Jonah Brucker-Cohen and Katherine Moriwaki that synthesizes and processes the steady stream of Twitter feeds for several American reality television shows such as “American Idol,” “America’s Got Talent,” “America’s Next Top Model,” and “X Factor US” among others in this genre. The project highlights when and how these shows gain popularity through social media and followers. When tweets are sent, they are dynamically displayed along with the bias for each program which is based on retweets from followers as well as fans. The visualization takes the form of a horizontal bar graph in the shape of an American flag that updates dynamically. Each show’s virtual presence grows in size based on the amount of attention it receives from social media users worldwide, creating a measurement meter that ranks popular media on their social exposure, rather than their credit as viable media sources. Commissioned for the Whitney Museum of American Art in 2012 for Artport, with support provided by Jeremy Levine. Jonah Brucker-Cohen is a researcher, artist, writer. He holds a PhD from Trinity College Dublin and teaches media and design at Parsons School of Design and New York University. His work has been shown at festivals and venues such as Ars Electronica, Transmediale, San Francisco Museum of Modern Art, MoMa, Whitney Museum of American Art, ICA London, Tate Modern, and has been a contributing writer for Make, WIRED, Gizmodo, and others. Katherine Moriwaki is an Assistant Professor of Media Design in the School of Art, Media, and Technology at Parsons School of Design in New York City. As faculty at Parsons Katherine’s focus is on interaction design and artistic practice. She teaches core curriculum classes in the M.F.A. Design + Technology Program where students engage a broad range of creative methodologies to realize new possibilities in interactive media. Katherine is also currently completing a Ph.D. in the Networks and Telecommunications Research Group at Trinity College Dublin, which examines the intersection between fashion, technology, and creative practice. « Rachel Bee Porter (MFA'10) and Marie Vic (MFA'10) in Come & Get It!